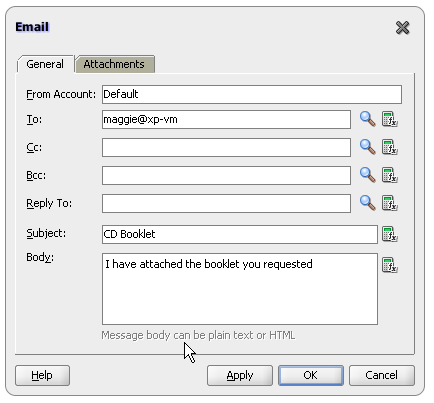 In my previous post I described how to send an email with attachment from Oracle BPEL (https://technology.amis.nl/2012/02/05/sending-an-email-with-attachment-from-oracle-bpel/). This post described a rather simple approach to send emails. In this post I will describe an advanced email component as an alternative. In the ‘simple’ approach the used variables of the email activity are a combination of static and dynamic parts. Static in the way that it often contains a default subject and/or body. 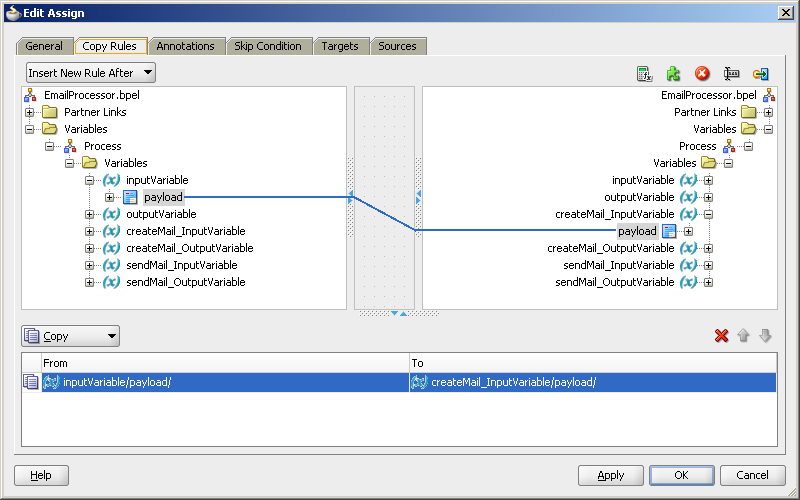 Optionally extended with the content of BPEL variables (dynamic). Changes in the static parts result in a redeployment of the composite. Especially in the subject and body part this happens quite often. The advanced component that I will describe overcomes the redeployment disadvantage. Instead of directly entering the content in the email variables/fields, the (static) content of the subject and body part is loaded as a template from an external source. For the example I will get it from a database table (see definition below). After loading the template, the dynamic content is appended. Later on I will show how to construct the request in BPEL. Now I will continue explaining how the request is processed by describing the individual components of the solution. Before I do this I will first give an overview of the solution in the appearance of the composite. The incoming request is picked up by the MailService mediator and routed to EmailProcessor BPEL process. 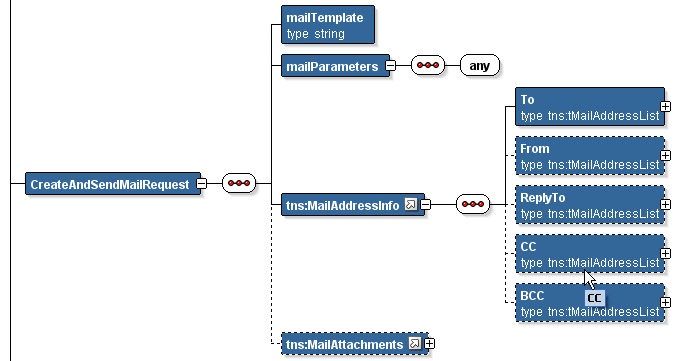 As shown in the picture below, this process invokes the EmailBodyCreator BPEL process (via the MailService mediator) to construct the email message. 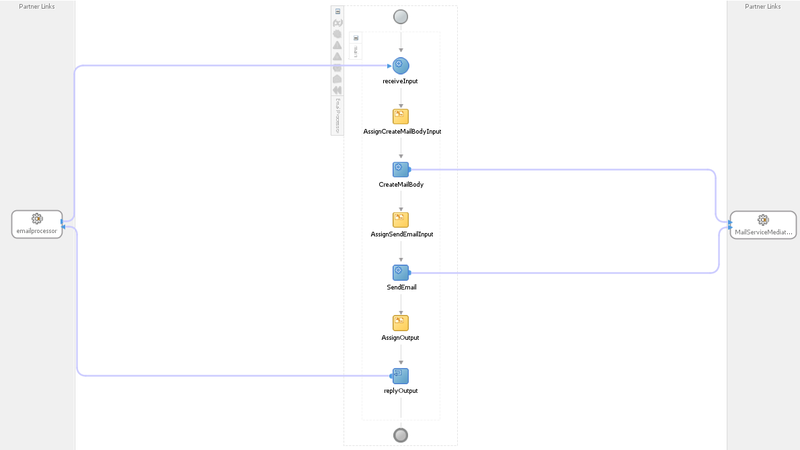 The payload of this request is a subset of the incoming payload (template and variables). 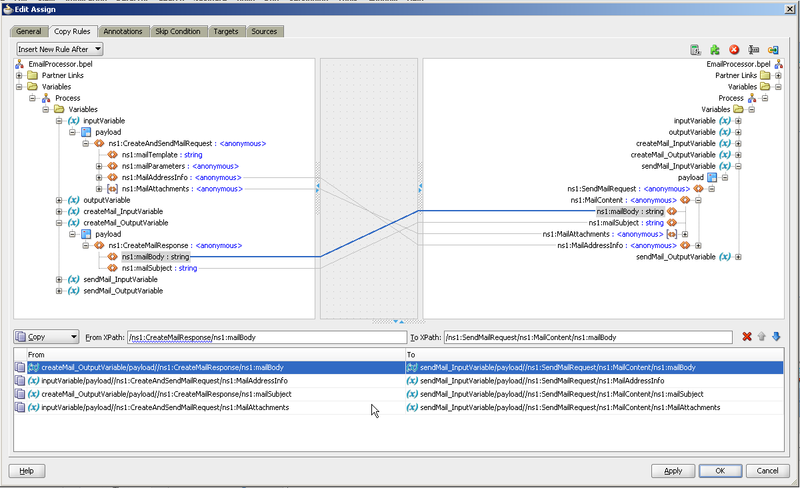 The EmailBodyCreator BPEL process I will explain later on. Now I will continue with the received output payload of it in the EmailProcessor BPEL process. This output payload together with the input payload of the EmailProcessor BPEL process is used as payload when invoking the EmailSender BPEL process (via the MailService mediator) to send the email message. Subsequently, the output payload of this EmailSender BPEL process together with the output payload of the EmailBodyCreator BPEL process is sent back as the output payload of the initial request. 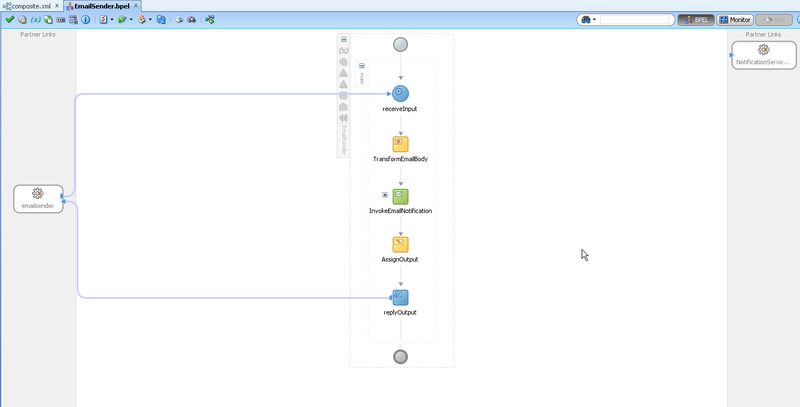 The EmailBodyCreator routes the received ‘template name’ (as part of the input payload) via a mediator to a database adapter to get the requested template. The database is making use of the following database package (only the body is shown) to find the template. For now it is a very straight forward procedure, but it is prepared for possible future changes. The procedure decouples the underlying table. 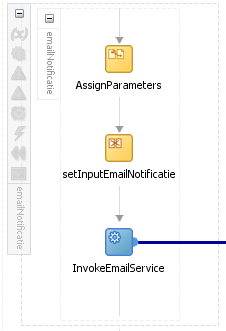 The received email template together with the received payload is after transformation sent to the MailCreator Spring component. 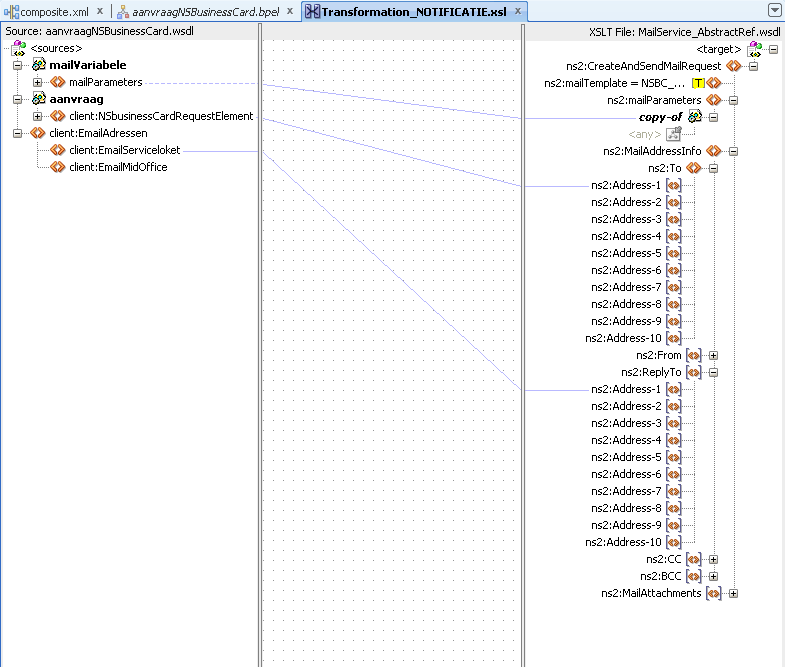 The functionality of this component is implemented in the MailCreator java class. The createMail method replaces al variables in the template and then returns the email body en title. Subsequently these are returned to the EmailProcessor BPEL process. 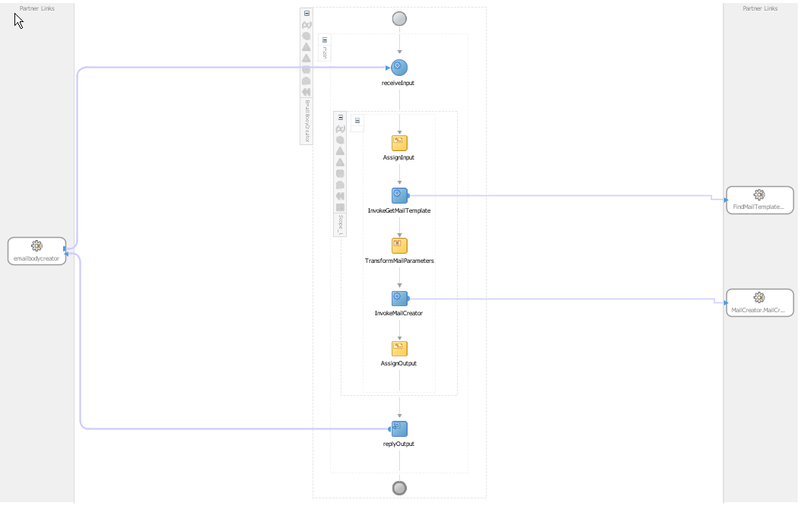 The EmailSender BPEL process transforms it’s payload to the required format of the email task. 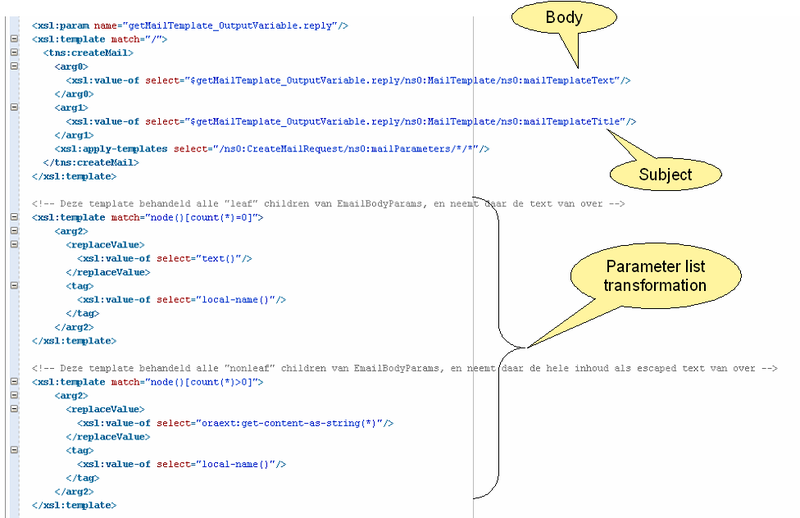 The relevant part of this transformation is show below (design mode view of this transformation is not supported by JDeveloper). Finally the outcome of this transformation is send to the email task. The email task is invoked using this outcome as input Payload. In the remaining part of this post I will give an example of how to construct a request like the one shown at the beginning of this post. The calling BPEL process has the following three step construction. 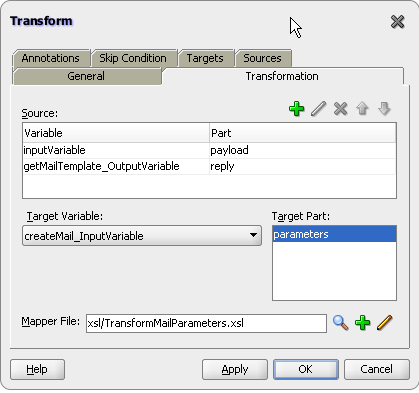 Second, transform data to the payload format of the Mail Component.